Fasten your seatbelt and travel the world with My Jumbo Holiday Jet! 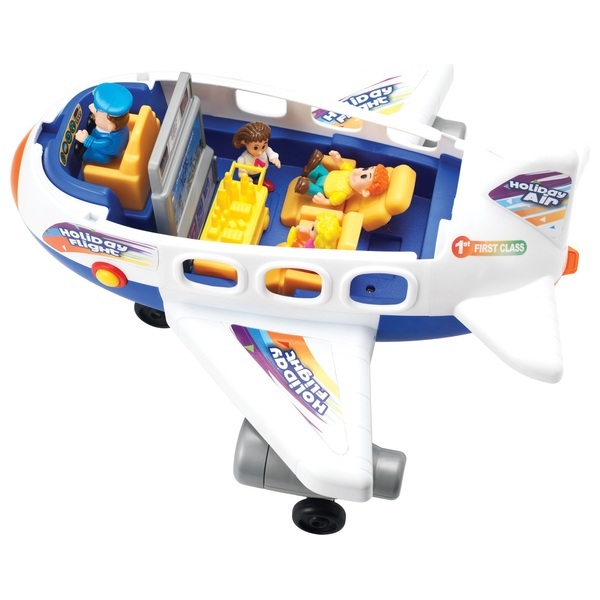 Help your passenger figures check in at the information counter and board the colourful jumbo jet. Zoom around in the cargo truck to load luggage into the back of the plane, then get ready for take-off. When the realistic engine sounds start up and the lights on the airplane flash, you know it’s time for your hols. Push the food trolley along with the flight attendant figure to help everyone on the Big Steps Vroom My Jumbo Holiday Jet enjoy their flight. The connection toy vehicles create between real life and play is what makes them such timeless toys. With Big Steps Vroom My Jumbo Holiday Jet, kids can bring the world around them into imaginative play. In toy vehicles, storytelling meets physics. Children can get creative with how fast or slow they move cars and planes to bring their stories to life. Bright colours stimulate a child’s vision, while playingwith moving vehicles develops spatial awareness and an understanding of cause and effect. Learn how you move and learn how objects move! Playing with vehicles encourages pushing, pulling and following, enhancing gross and fine motor skills.